1. On the way to Shutter Island, U.S. Marshal Teddy Daniels is having a more urgent problem than finding an escaped patient. What does he say it is? 2. Where does Teddy's new partner, Marshal Chuck Aule, say he is from? 4. Teddy finds a note in the room of Rachel Solando, the missing patient he and Chuck are trying to find. What does the note say? "Get out, now. Why them?" "The eagle flies at midnight." "The law of 4. Who is 67?" 6. While visiting with Drs. Naehring and Cawley, Dr. Naehring asks Teddy who raised him. Teddy's response? "The best mother on earth." 7. Teddy is told about an amazing new antipsychotic drug being given to some of the patients - the first of its kind. What is it called? 8. Teddy sets off a patient he is interrogating about Rachel Solando. What is Teddy doing that drives the patient crazy, so to speak? 9. What does Mrs. Kearns, another patient, write in Teddy's notebook once Chuck has gone to get her a glass of water? 10. Why does Teddy tell Chuck he intentionally took on this case? 13. 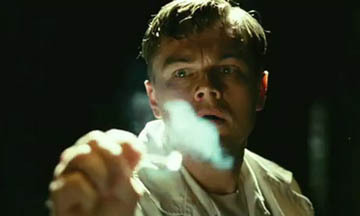 What problem does Teddy start having while at Shutter Island? 14. The backup generator dies, the patients are running loose, and Teddy decides it's time to check out the C Ward. While there, a patient grabs Teddy and starts yelling at him about...what? 15. What does Teddy hear being whispered as he's walking down a corridor in the C-Ward? 16. Patient George Noyce tells Teddy what really goes on in the lighthouse. What is it? 17. Chuck finds Teddy and tells him that he has obtained Andrew Laeddis' admittance form, which proves...what? 18. After deciding to go to the lighthouse on his own, Teddy turns around and goes back to tell Chuck he can't get there due to the tide. Unfortunately, it seems Chuck fell to his death on the rocks. What clues Teddy in to this fact before he sees Chuck's body? 19. What discovery does Teddy make when he finds a cave while climbing the rocks, trying to find Chuck's body (which seems to have disappeared)? 21. After being told by Dr. Cawley that he came to the island alone, without a partner, Teddy causes a distraction so he can get to the lighthouse. What does he do? 22. Why is Teddy trying to get back to the lighthouse? 23. Teddy gets to the top of the lighthouse and finds Dr. Cawley sitting at a desk, waiting for him. What are Dr. Cawley's first words to Teddy? "What took you so long, Marshal?" "Nice to see you, Andrew." "Why are you all wet, baby?" 24. What does the "Law of 4" relate to?